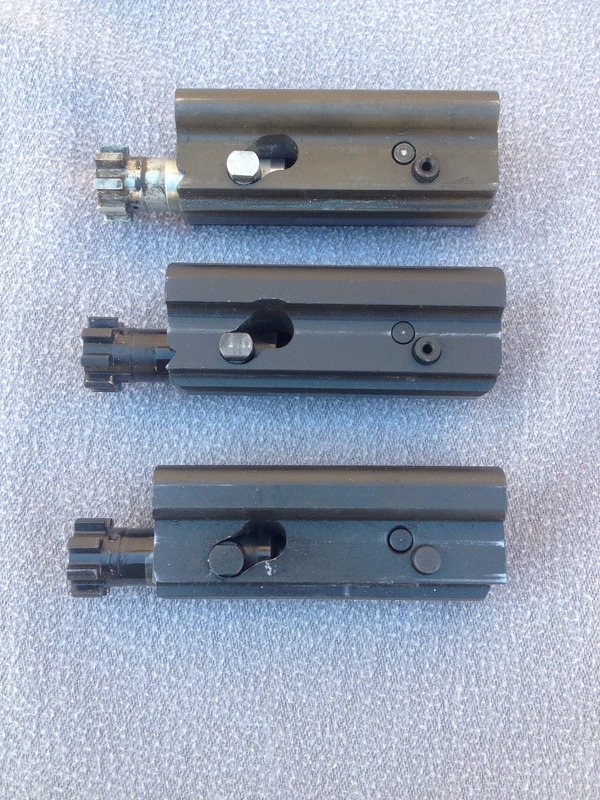 I was first prompted to look at the differences in bolt carrier groups between my guns when I started my Shorty Project. 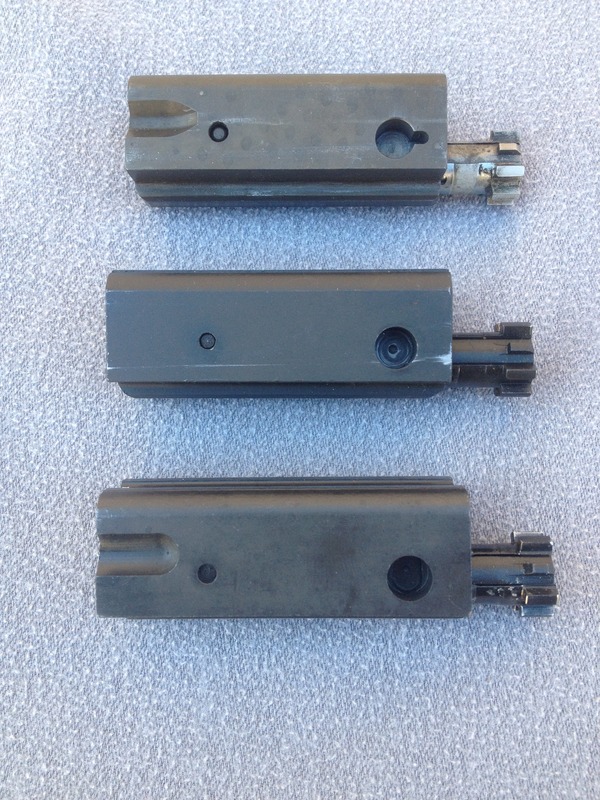 With the purchase of my Vulcan V18 I now had 3 versions of these bolt carrier groups and was able to examine them closely. 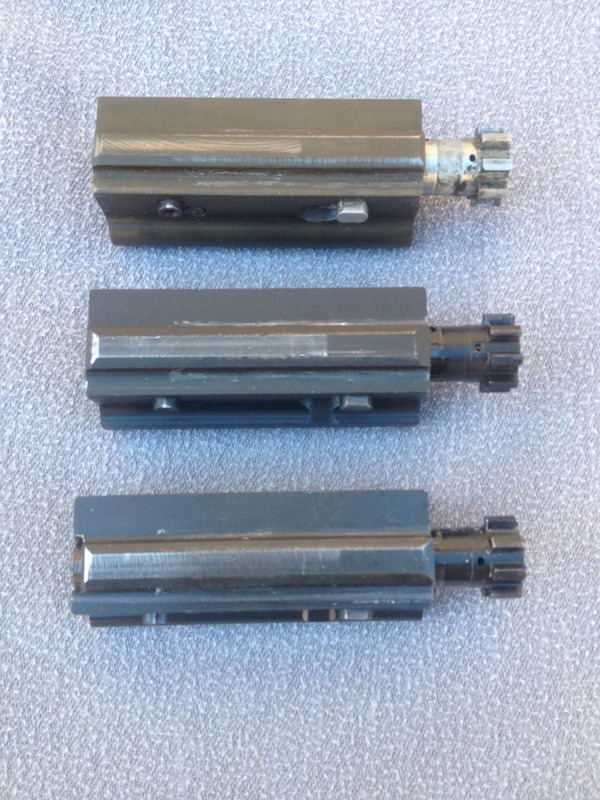 My hope is that these will be of use in the future when someone finds a BCG and needs to identify what gun it originally came from. 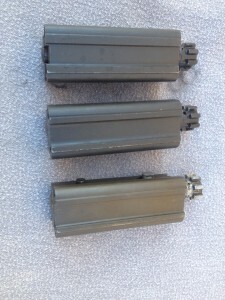 The three BCG’s are, in order from top to bottom, Sterling AR-180, Armalite AR-180B, and Vulcan V18. The first thing that jumps out is that the Sterling BCG features a chrome bolt and cam pin. The others are parkerized. All three carriers are parkerized as well but the Sterling is a different shade with a slight green tint. The Sterling and Vulcan carriers have a cut out on the right rear that is used to open the dust cover. The Vulcan does not have a dust cover so we can only guess as to why it was put there. 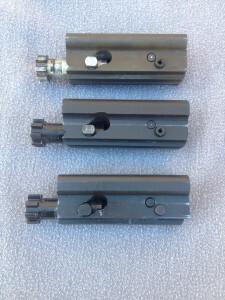 The Sterling carrier is machined for the locating lug on the charging handle. The 180B is a simple hole, and as mentioned in an earlier post, the Vulcan has a slot and a hole. 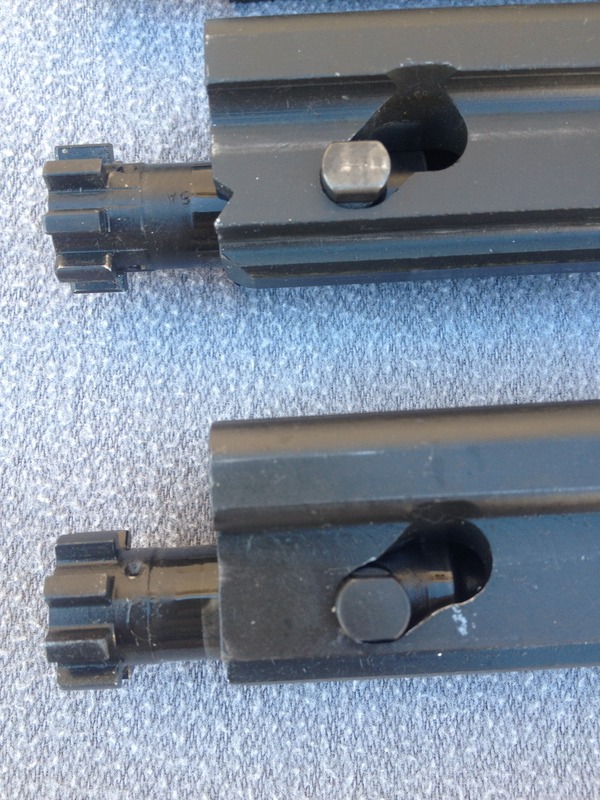 The bottoms are very similar but you can just make out the differences near the firing pin on the Vulcan. The left side of the Sterling has a radius cut around the guide rod hole where the other two no not. This leads to a divot being left in this area after the machining of the cam pin hole is finished. You will also not that the guide pin of the Vulcan is solid and the others are hollow. Next I discovered why I was unable to get the Vulcan’s last round bolt hold open to work. There is a angled slot that is machined into all the 180 carriers but not the Vulcan. 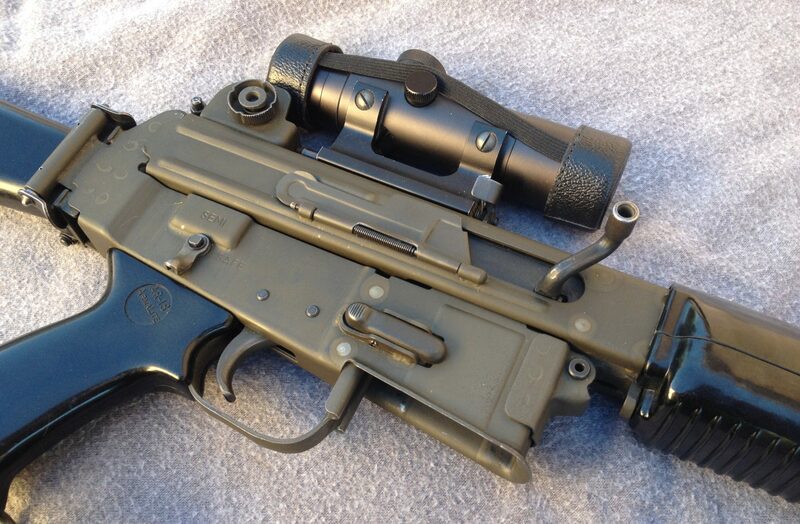 We must remember that the Vulcan originally used a modified AR-15 lower and they needed it to work with that bolt hold open. My original plan was to copy the 180B hold open but that will only work if I cut this slot. I will first try to re-engineer a different hold open and see if I can make that work. 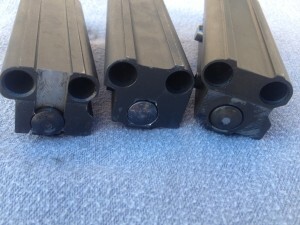 The remaining pictures are showing the BCG’s in the order, Vulcan, 180B, Sterling. Top to bottom and left to right. The tops are very similar but you will notice the Vulcan carrier shown has wider flats and a slot cut into the rear face. Here you can clearly see the biggest difference in that the Vulcan carrier has had a large slot machined into the rear face. This is because the hammer was located further forward on the modified AR-15 lower and they attempted to compensate for that. It did not work too well on this particular gun. 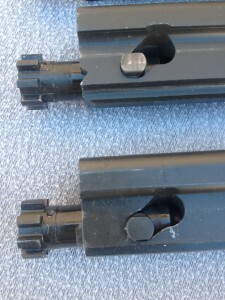 The Sterling carrier on the right slows the radius around the left guide rod hole that is not present on the others. You can also make out that the firing pin hole is chamfered and the area around the guide rod holes has been relief cut. . The chamfer was left out on the 180B and caused some problems with the hammer peaning the edges of the hole and was restricting the movement of the firing pin. I modified this area on mine so that would not happen again and this is something you should inspect on your 180B if you own one. I hope this can be used for reference and be of some use down the road. Feel free to comment if you see things that I missed or have any other questions. Please subscribe and contact me if you have any questions or would like to contribute in any way. While this may have little to do with the AR-180, I feel many of you will appreciate what a fantastic read this book truly is. House of Apache Fires is a historical fiction set in the waning days of World War II. It weaves documented facts with fact based conjecture to fill in the gaps and is simply a joy to read. Set in my home state of Arizona, I often said to myself, this could have actually happened and they just kept it all from us. I can’t wait for the movie version to come out. What a ride that will be. Anyway it’s free for the next 3 days so do like I did and get the kindle version and if you love it as much as me, support the author and buy a print version. I got a call yesterday that Chuck from GunLab would be traveling through Tucson and he wanted to stop by and meet. We chatted for quite a while and I got to do a little show and tell so he cold take some pictures for the AR-180 section of his site. He was passing through on a super secret gun buying mission the details of which I am not at liberty to discuss. But let me just say that his mission was a success and I got to fondle his new acquisition. I’m pretty sure I had a dream about shooting it last night. I hope that becomes a reality someday. I had a blast talking guns last night and he and his wife are some of the nicest people I have ever met. It was a true pleasure to have them at my home. I also have an open invitation to visit the Lab and I will be heading up there soon. I was shocked that Nathaniel had even found my little ol’ blog but could not be prouder. Make sure to check out all the articles he has over there, I visit it often and I am always finding something interesting. It is a great site. Please subscribe and comment with any suggestions on how I can improve my site. They should be up and running but just require approval beforehand to keep the spammers at bay. Speaking of spam,since my email notices from this site have my personal email as a return many spam filters will immediately drop them in the spam folder. Please white list my site and they should start showing up in the inbox, where they belong.